All mail order plants will be sold in 9cm pots, sometimes 1litre, rarely bare root splits from stock beds. Bearded Iris= flowering size bare root plants. 1. 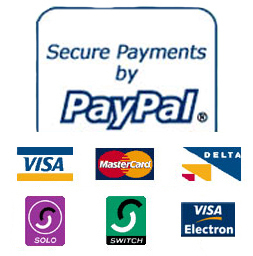 We have created our shopping basket through PayPal. This is a well known worldwide company that offers a safe, easy and quick method to purchase over the web. We are fully registered and are verified with this company and have used it to buy things for ourselves and fully trust the service it provides. We have been using this system on our website for 8years without problems. When purchasing off our website your items will be added to a shopping trolley. You can at any time can go back and view this, adding to it or taking things off. After shopping you just click checkout. It's simple. Then you just follow the instructions. From that PayPal will then send us an Email saying what you want and the quantities along with your address. We endeavour to fulfil all orders but due to the nature of the plant growing business and the problems of each season some plants will not be available at the time of ordering. If this is the case you will be made aware and either an alternative will be offered or a refund given. THE INFORMATION THAT YOU PROVIDE US WITH, WILL NOT BE PASSED ON TO ANY THIRD PARTY. These are actual costs we make nothing out of them.